Good Quality Skirt with best fabric quality for women wear. 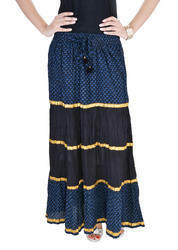 We have Traditional Cotton Printed long skirt, Tie dye Bandhej Skirt, etc. Wholesale Price : 310.00 for available stock only. Minimum Order Qty. : 4 Pcs. Job work Stitching Charge : 120 INR for Minimum 300 Piece.